I’m not a gym rat, nor do I get pumped up to ride my bike for hours on end. It takes a lot to convince me to leave the house and sweat. Still, there’s something particularly convincing about the new Polar M600 Android Wear smartwatch that makes me think I could start a disciplined work out routine of my own. I just wish it it didn’t look like it was designed specifically for the athletic man. The Polar M600 is the first truly fitness-centric smartwatch to come to the Android camp. It offers fitness and sleep tracking that trumps most other fitness bands and sportier Android Wear watches. This is not a smartwatch designed for a sedentary couch potato who merely wants to track his steps. Rather, it’s for the devoted athlete who is serious about physically training for the next big showdown, or anyone who might be looking to transition to a heavily active lifestyle. I had the opportunity a few weeks ago to wear the M600 and sample its fitness tracking app. I really like what Polar is attempting to do for Android Wear, though I’m also a bit put off by the bulky, masculine aesthetic of the M600. Android Wear has come a long way since the first G Watch hit the scene, and the design of the M600 almost feels like a step back. This giant smartwatch is too big for most wrists. The Polar M600 is a gigantic smartwatch covered in smooth, black silicone. It reminds me of a toy watch I would have worn in the 90’s, though it also resembles a bloated version of the discontinued Sony Smartwatch 3. It’s big, and it sticks out about a quarter of an inch off the wrist. Smaller hands will have trouble bending backwards while wearing this thing, and I can’t imagine trying to transition from plank to downward dog with this behemoth strapped on. The bottom side of the M600 features six LEDs for heart-rate monitoring. I tried on the M600 for about half an hour and while its material is very comfortable, its bulky aesthetic is not particularly attractive. Polar’s justification for the M600’s size is that it’s chock full of features you don’t get with a typical Android Wear watch, and for the most part that’s true. The M600 is not only equipped with both GPS and GLONASS, but it’s also waterproof, and it can withstand dynamic pressure so that divers can take it underwater. The Polar smartwatch also employs six LEDs on the bottom of the device for more accurate heart-rate monitoring, compared to the one LED light most other watches use. I tried it out for myself and the darn heart-rate monitor gave away how anxious I get during briefings. I had no idea my heart beats so fast when I’m on the job! The M600 runs on a 500 mAh battery, which the company says should last up to 48 hours on one charge if you’re using the watch with an Android phone. (iPhone users will see battery life of up to 24 hours because of the lack of Bluetooth LE optimization.) Like most other Android Wear watches, it features the traditional on/off side button, though there’s also an easy access button the front of the device that you can press when you’re ready to start a work out. 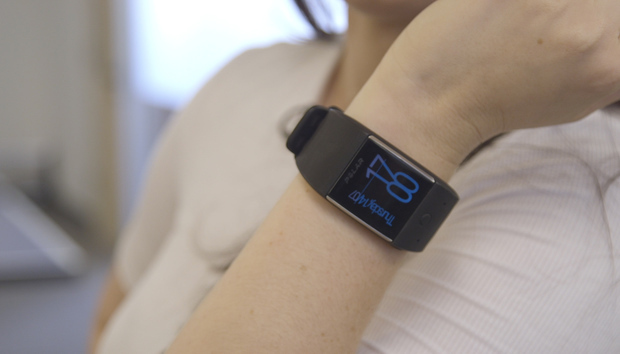 This isn’t Polar’s first dance with wearables. The company already offers an extensive line of fitness tracking devices, including the V800 smartwatch, which is widely used by professional athletes around the world. It’s likely that Polar kept the M600 simplistic so that there’s some unity among its product lineup, but I would have liked to see at least another color option and a thinner chassis to make it stand out from the rest of it siblings. The Polar Flow app that comes preloaded on the M600 is already available in the Play Store. Polar hopes that its app will be what reels you in. The M600 comes preloaded with a companion app called Polar Flow, which you can peak at in the Google Play Store. The app is only compatible with Polar’s fitness trackers, so you can’t use with just any Android Wear watch. Polar Flow tracks all sorts of activities, including running, hiking, swimming, yoga, and cross-country skiing. The idea is that if your body can do it, the app should be able to track it. The app tracks active time, burned calories, steps walked, and sleep patterns (though I can't imagine sleeping with it on). It also offers a quick overview of your training and analyzes performance over time. I was impressed at the variety of activity offerings available in the Flow app, but I can’t speak to how functional it is when paired with a regimented training routine just yet. I’ll definitely be trying that out when the M600 comes in for review. The M600 is geared up for the rigidly trained athlete who relies on numbers to quantify their physical improvements and wants other app functionality. But for the average Joe who just wants to track his steps, there’s a whole Play Store filled with other Android Wear offerings that are more stylish, and more comfortable to wear. Perhaps all the functionality of the Polar M600 is totally worth the sacrifice of bulking up your wrist, but we won’t be able to tell until we try out the smartwatch for ourselves when it launches later this year.